Following an interest in medieval Europe, I decided to start work on a chainmail shirt (high school). I chose mail armor over other types of armor because of its relative simplicity. It didn't require special tools or skills, just lots of time. 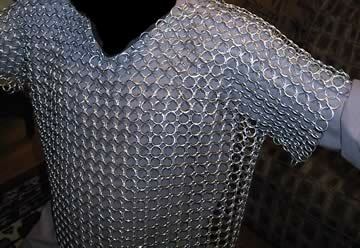 The primary unit of mail armor is a single ring. After reading a little online, I figured out how to make them. Take one end of the wire and use the clamp/vise to hold it to the dowel. Now take the metal wire and wrap it around the dowel. Coil it tight (with no gaps) for better rings. Each complete turn will be one ring. After you have coiled a sufficient length, cut the wire at the bottom, and slide the coil off the dowel. It should look like a big cylinder or a compressed spring. Now spread the rings apart by grabbing each end of the coil and pulling it apart. You can even out the spacing by moving along the coil and adjusting it bit by bit. 1/4 inch gaps are sufficient. Now take your wire cutter and work up the “spring” cutting along the same line. You should produce little open rings. Lay out rings in a row. I used a string threaded threw the rings to make it easier to see when putting in the first few layers. Now look at the first two rings in the row. Take an open ring, and thread it through the first two and close it with the pliers. Then move to ring 2 and 3 and attach one under those two, and so forth for the rest of the row. Continue this until you have a sheet of it. It's very confusing at first, but stay with it. You'll soon figure out the pattern and be able to identify where the rings should go. I can’t describe how I completed my entire mail shirt because I built it piece by piece. I can only tell you to visualize what it would look like laid flat and construct the individual sections. These are roughly the steps I did to finish mine (see right). Making the top of the hauberk is one of the hardest parts to get right. It has to fit the head and rest across the entire shoulders comfortably. Building this part ring by ring would be time consuming and have a greater probability for mistakes. Notice that I started the top by making four parallelograms, a simple shape to produce. When joined together, the top half was finished. By breaking down complex parts into manageable, simple shapes, the process becomes much smoother. Image bottom-left is the shirt at 2500 rings (on a smaller person). 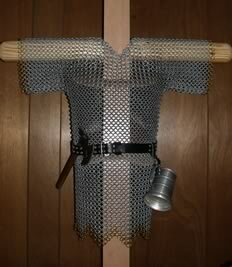 I eventually expanded the hauberk below my hips and with sleeves to my elbows. This expansion more than doubled the number of rings! The finished shirt weighs in at about 16lbs. Brass trim was added early April 2002 on the sleeves and dags (triangles at bottom). It is comprised of over 5100 rings. Estimated construction time is about 45 hours. Considering this is my first mail project and many mistakes were made along the way, this time isn't bad. By the end, I was adding around 1 ring every 7 seconds. 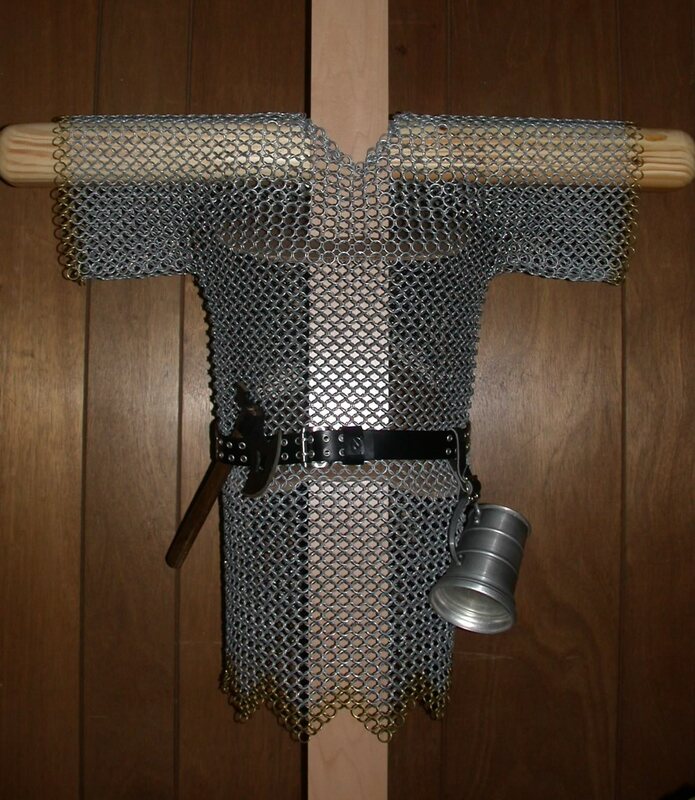 September 20, 2002 - I just started working on a new hauberk. It's using the same 14 gauge 1/2" ID rings, but the pattern is 8 in 1. It's really dense! December, 2002 - The material consumes so much time to produce and so many rings, I've decided to stop. It is now a decorative item in my bedroom.